River Cruise with Fr. 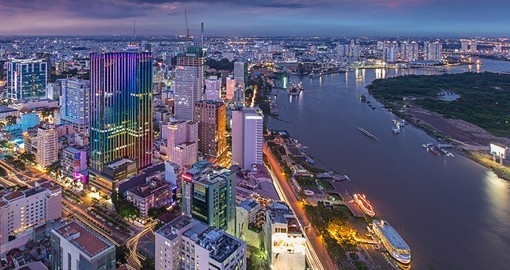 Tom W.
​Lively Ho Chi Minh City, once known as the "Pearl of the Orient," offers a vibrant mix of old and new and provides the perfect start to your incredible journey through Vietnam and Cambodia. 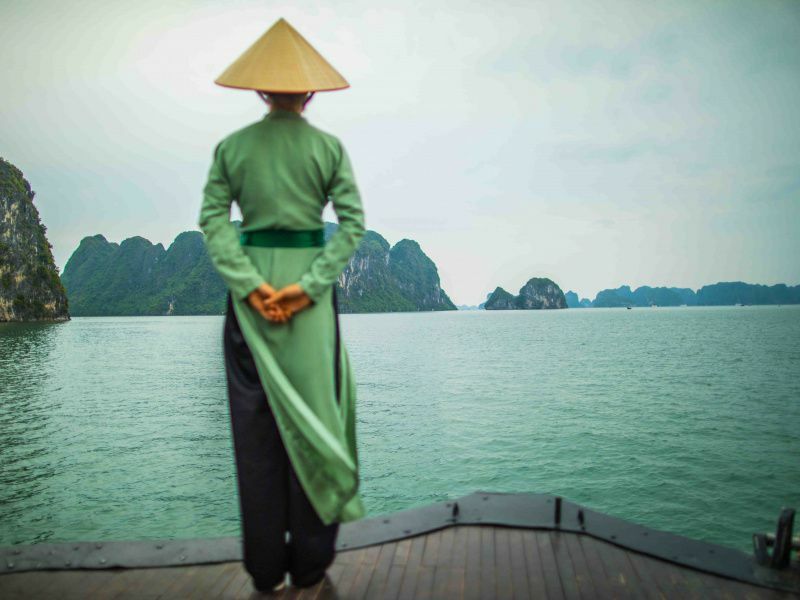 Cruise along the mighty Mekong, discovering a glimpse into another era; one where people still happily honor the timeless traditions passed down through the centuries from their ancestors. Throughout your trip, immerse yourself into the culture and heritage with visits to rural villages, historic pagodas and colorful markets. 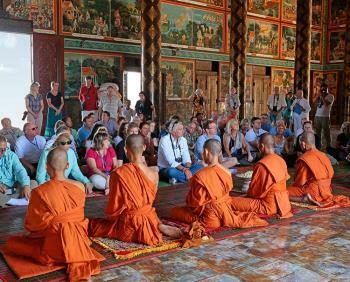 Be treated to a special blessing by monks in Buddhist monastery, meet elementary students at a local school, and witness skilled artisans who create exquisite handicrafts and delicacies. 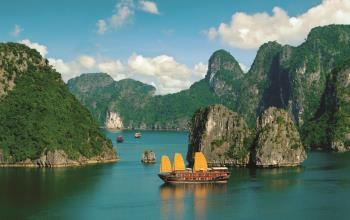 Experience all this and more on this life-enriching cruise along the Mekong. $1,095.00 per person double occupancy. The single supplement is $400. Day 1- Arrive in Hanoi. Private transfer from the airport to the hotel. Day and evening at leisure. Overnight in Hanoi MK Premier Boutique Hotel. Sep 27 - Arrive in Ho Chi Minh City. Transfer to hotel. Dinner (included) at a local restaurant. 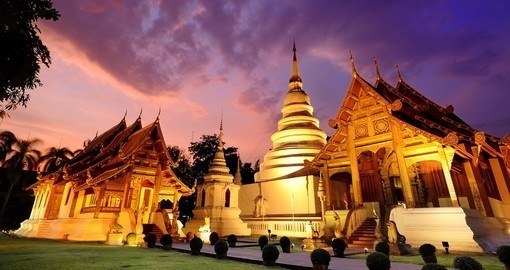 Oct 9 - Transfer to the airport for flight home, or to *Chiang Mai for the Chiang Mai Retreat Extension with Fr Tom. Enjoy a visit to Tan Chau, a small Mekong River town unspoiled by tourism. You will have the opportunity to get an authentic experience and take a traditional "xe-loi" (trishaw) ride around the town, with stops at silk-making and rattan mat workshops, followed by a boat ride through the narrow channels of the Mekong River to "Evergreen Island." 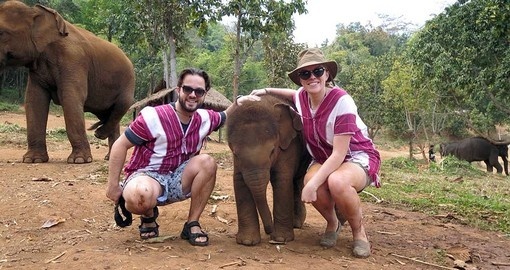 Alternatively, simply take the boat ride to Evergreen Island and return to Tan Chau, where you will visit a rattan mat workshop. Later in the day, cruise from Vietnam to the Cambodian border en route to Phnom Penh. Visit Oudong, Cambodia's former royal capital from the early 17th century until 1866. Today, Oudong is a place of pilgrimage for Cambodians. While here, be treated to a memorable Buddhist Blessing Ceremony at a monastery. In Kampong Tralach, you will have a truly authentic excursion – an oxcart ride through a local village along the river bank. 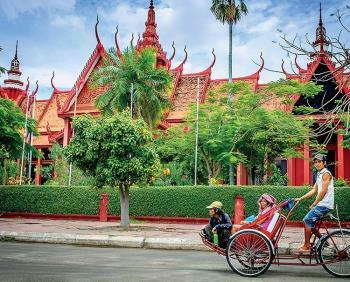 Later in the day, experience Phnom Penh via a tuk tuk ride and be enchanted by the city's French Colonial architecture and tree-lined boulevards set amidst monumental Angkorian architecture. In the morning, set sail for Oknhatey Village. Oknhatey is the "Silk Island," located on the lush banks of the Mekong River and known for its rich tradition of silk weaving. While here, you will visit a local elementary school and observe the traditional silk weaving of handicrafts. Your cruise continues to sail to Phnom Penh. 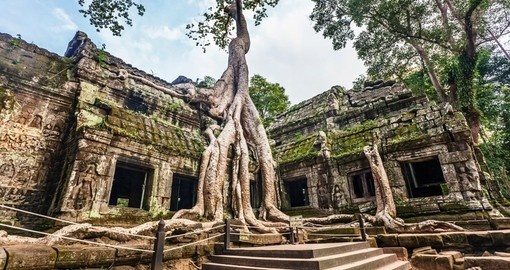 Go on a walking tour of Angkor Ban, one of the few villages in Cambodia that was not destroyed under the Khmer Rouge regime in the 1970s. Here people still live in their traditional wooden abodes and keep their old cultural traditions alive. Hundreds of wooden houses stand intact on stilts, shaded with banana trees, among the hustle and bustle of the daily agricultural on-going of the local villagers. After visiting here, the ship sets sail for Kampong Cham, where you will go on an afternoon excursion via motorcoach to the Twin Mountains, known as Phnom Pros and Phnom Srei (male and female mountains). In the annals of Khmer legend, the twin mountains were formed as the result of a competition between the men and women of an ancient Cambodian kingdom to resolve which gender would be responsible for wedding proposals. Cap the day off with a festive Farewell Dinner on board. *Note: We recommend that you schedule your onward flight to depart Siem Reap after 5:30pm today to avoid potential missed connections. Includes airport transfer for those not attending the Post-Cruise Angkor Wat Temple Tour Oct 7-9. $775.00 per person double occupancy. The single supplement is $350. Fr. 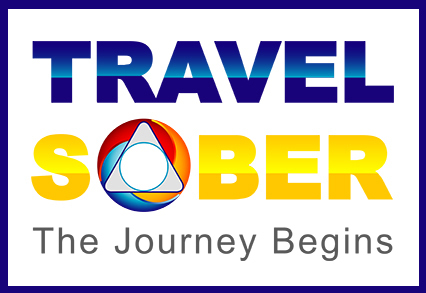 Tom W. is a noted retreat leader and conference speaker worldwide. His Jesuit education and experience as a world-traveler combined with a blend of wit and wisdom endears him to people of all faiths and life paths. About the Ship: This distinctive ship is in a class of her own! AmaWaterways' sole cruise ship on the Mekong River, the AmaDara features French Colonial décor and richly carved wood furniture inspired by the history of the region, as well as local artifacts made by native craftsmen. Air-conditioned interior corridors lead to spacious staterooms and suites, most featuring twin balconies that invite the ever-changing scenery of Southeast Asia inside. On board, the AmaDara caters to your every whim, with massage rooms, fitness room, gift shop, hair salon and Sun Deck pool. Her stunning Saigon Lounge provides respite by day and unites guests over intriguing local entertainment by night. Savor authentic regional delicacies and Western cuisine in the Main Restaurant or dine at The Chef's Table specialty restaurant.